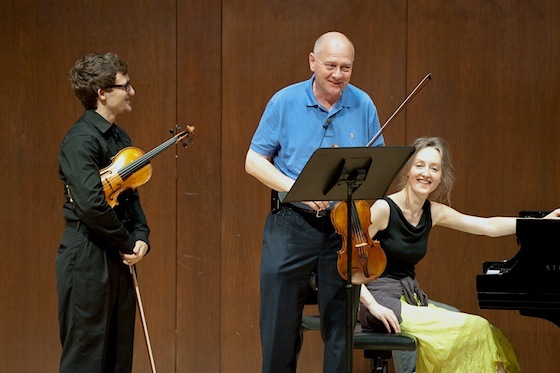 June 2, 2013, 9:54 PM · "I can't wait to hear Bill Preucil talk about Mozart!" 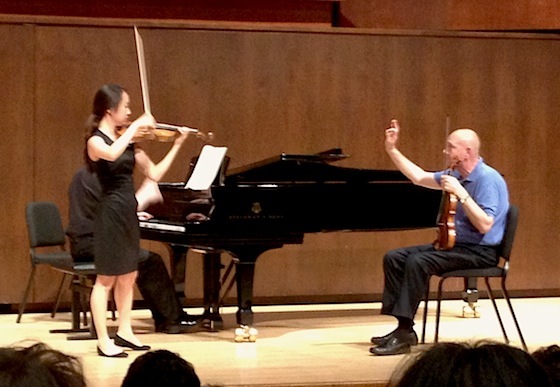 I overheard one of my colleagues say at the Starling-DeLay Symposium on Violin Studies at The Juilliard School. How often do you get to hear the wisdom of someone who has sat in the concertmaster chair, heard hundreds of auditions, played as a chamber musician, played as a soloist and also taught at the highest level? 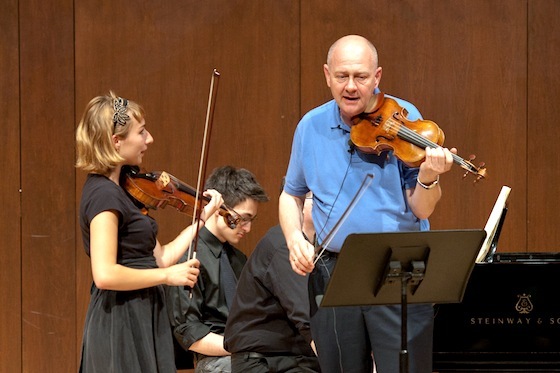 Bill Preucil is all that -- with a staggering amount of experience, both playing and teaching the violin. Concertmaster of the Cleveland Orchestra since 1995, he also was concertmaster of the Atlanta Symphony for seven years, and concertmaster of the Utah and Nashville Symphonies. And he is a chamber musician, having performed as first violinist in the Cleveland Quartet for seven seasons. Currently he is Professor of Violin at the Cleveland Institute of Music. He started violin at age five with his mother, Doris Preucil, Suzuki pioneer, and went on to study with some of the 20th century's greatest violinists: Josef Gingold, Zino Francescatti, and pianist György Sebök. 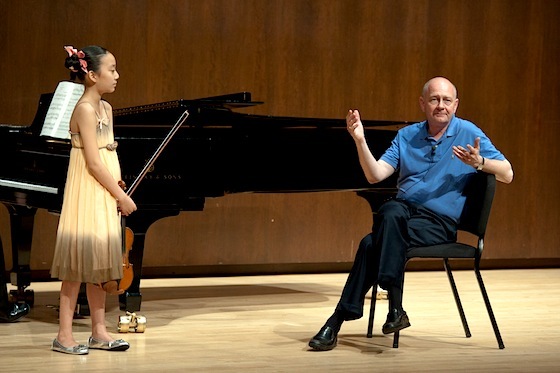 Having treated us to his artistry as a performer in a recital the night before (more about that in a separate blog), William Preucil took the stage at Juilliard's Paul Hall on Saturday to teach a master class to five young artists. Throughout the class, he emphasized the idea of listening closely and creating long lines in music. He was also full of great metaphors -- and funny faces! First up was Ji Min, who played the first movement of Mozart Concerto No. 4. It's a piece that she -- and all of us in the room, no doubt -- knew very well. It can be tricky to pull off. Technically, it requires pristine intonation and articulation. But musically it can be a problem, too. "There are some difficult things about the way he wrote it," Bill said, and it's very easy to get too much emphasis on the beat, taking away from a longer musical line. It's important to examine this question: How do you make certain notes sound more important? Three ways: you can make them louder, give them extra vibrato, or make them longer. In Mozart, it's all too easy to make too many notes into important notes. When practicing, watch which notes are louder, which notes receive extra vibrato, and which notes are longer. It should all be intentional. Ji Min was occasionally falling into the trap of playing last notes too long. "You just love them so much you don't want to let them go," Bill said. But that can make them too important, and it can break up a longer line. "One of the things that makes us love Mozart is that he had such a wonderful understanding of human emotion," Bill said. Knowing that he was a composer of operas, "sometimes it helps to think in terms of opera -- something that is purposely over-dramatic, and with a story." For example (here is where you can get out your Mozart 4 score, dear readers): at m 49, the music goes back and forth, "like two people having a conversation," then at m 52 "they grab hands and run up the hill." Also, leaps from low to high notes can be more dramatic. "Using timing, you can make them more spectacular, more gymnastic, without ruining the rhythm," he said. He asked, what is the most important note at m 70, a place with a sequence of rests and 16th notes? After letting Ji Min toy around with emphasis on this note and that, he announced, "It's the note you don't play!" The rest -- where the orchestra plays and you don't -- is actually the most important. Your part has to bounce off theirs. Back to our Mozart 4 score: m 115 starts a happy section, followed by sad. Or to turn it into an opera scene: At m 115, we have a girl picking flowers :). But then at m 117, the girl is kidnapped! :o Or, maybe at m 115 we have two servants sneaking a kiss in the closet :). But at m 117, the master opens the closet door and discovers them! :o Either way, it's all followed by a chase scene at m 126. Bill demonstrated quite well simply with his facial expressions -- happy; sad; searching, with eyes darting back and forth. He could probably do an entire master class without saying a word, just using facial expressions! Ji Min asked Bill, how do you fix old, deeply-ingrained bad habits in pieces that you might have learned when very young? (Mozart Concerto No. 4 is such a piece, as it is in Suzuki Book 10 and so a fast-moving student might reach it at quite a young age). "One of the more advanced things in music is this idea of not having too many beats," Bill said. As you become more musically mature and aware of those long lines and phrases, you can also become more aware of how to create them with intention. You can also become aware of this when listening to other music by the same composer. For the Mozart cadenza, he advised that she "play it like you're not sure, like you're making it up," he said. He pointed out a note that she was overemphasizing then he asked, "Did you know you were doing that?" and she answered, "Not consciously." "A teacher's major function is to be a set of ears that is not attached to you," he said. A teacher can show you how to listen, so that eventually, you will be able to listen in a way that helps you get rid of those unintentional, not-conscious things that get in the way of the music -- on your own. For example, "Don't be careful on the run, then knock the last note. Trust yourself -- make it a gesture," Bill said. Next was William, who played the first movement of Fauré's Sonata No. 1 ("Allegro molto"). As in Mozart, Fauré's music can get lost in the details. The way it's composed, with so much repetition, can give it a measure-by-measure feel. That can get in the way of making longer phrases. "He marked it incredibly fast -- I'm not saying it should be played that fast," Bill said, "but it gives us a clue as to the nature of the melody and sound, that it could be airy, not grounded. It's busy, it's moving -- it's not getting stuck." William tried it with more abandon, and wow! He could pull it off at quite a clip -- I found it rather exhilarating! "That accomplished what I asked for," Bill said with a smile, "the trick would be to play it not-as-fast and still accomplish that." How? Well here's what he told William, but we might all wish to write this down and put on the wall next to our music stands: "Any time you're going to make the first note in a measure important, ask yourself, 'Should I be doing this?'" "And I wouldn't pick a daisy every two bars," Bill added, "I'd wait and pick the daisy at the end." Bill said that sometimes a dynamic marking in this music is actually more of a request for a change of color. 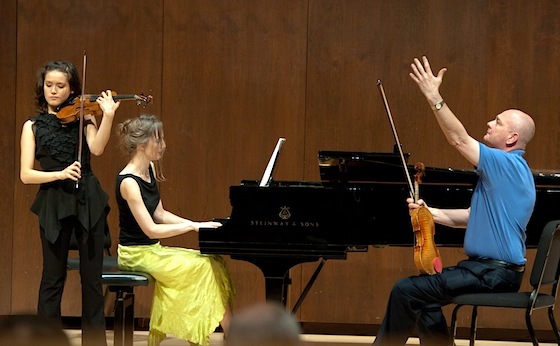 Gloria played the first movement of Poulenc's Sonata I for Violin, and her energy on stage was immediate and intense. That's probably because Poulenc actually marks this "violent"! Preucil wanted her to make more of the play between F and F# that Poulenc features heavily in the beginning of this movement. He also asked her to be more aware of a habit of starting the vibrato later on in a note. "That's a good trick, but just once in a while," he said. "Some notes are going to be okay without vibrato, too." He also wanted her to work on being able to connect notes with vibrato. "Listen to your vibrato, and not all the other beautiful things you are playing, and then your brain will send the message to your fingers and you will fix it," he said. Marié played the first movement of the Barber Violin Concerto. She was clearly committed to this piece, and I found her playing satisfyingly in tune and enjoyable, like she was just spinning silk the whole time. I wondered what anyone could add to what she was doing. But Bill -- seasoned concertmaster -- shared his helpful perspective on how to feel the orchestra part when performing as the soloist. For example, when the solo part creates an interval of a second against the orchestra's part, listen for and enjoy the way those notes rub against one another. He asked, in one part (in the score, rehearsal no. 4) that it be less driven, more like "you've prepared the practical joke but it hasn't happened yet." One place has a rather startling four-octave jump into the stratosphere -- "don't forecast that." He even had some ideas about how to hold the extremely long note at the end: be aware of the harmonic changes in the orchestra, and illustrate those changes for the audience by changing the color of the note just a little. 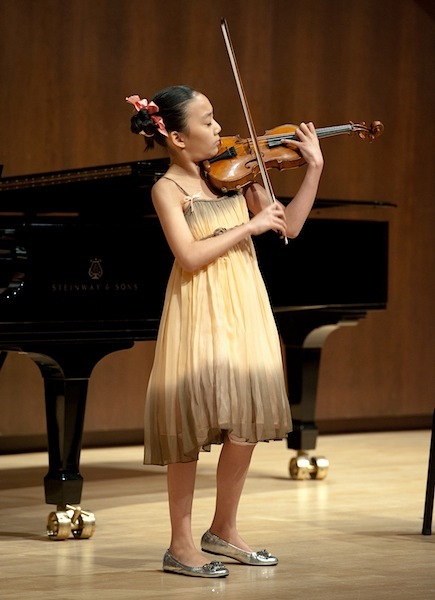 Last but not least, Elli, 12, played the entire first movement of the Tchaikovsky Violin Concerto, which is still famous for its dedicatee pronouncing it "unplayable." Not for Elli. Sometimes a teacher will hear only the first half of the Tchaik in a master class, but this was the final performance of the Symposium, and Bill let her play the entire gargantuan movement. Small person, big music. It kind of spoke for itself. What could he possibly say, after such a feat? Well, not much, but he did offer her a few ideas, without having her play any more: "Tchaikovsky could never resist sneaking a little ballet music into his pieces," so keep that style in mind. It helps to listen to other music by a composer -- his symphonies, his chamber music, and that gives you ideas about how to play the concerto.